Two days after leading his team out in the League 2 Play-off Final at Old Trafford, Manchester, Paul Buckle has left Torquay United to manage another League 2 side - Bristol Rovers. During his fours years in charge at Plainmoor, Paul Buckle became one of the most successful managers of Torquay United of all time. 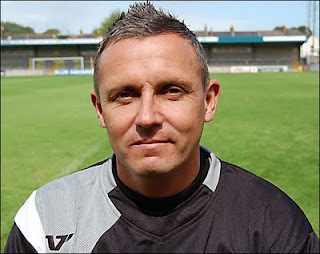 Paul Buckle, a former player with Torquay United, was appointed manager in the summer of 2007 when the club was in turmoil. They had just been relegated from the Football League after a disasterous season and a new consortium of local businessmen had just taken control of the club. At the time Buckle took over as manager there were just four players signed to the club - Lee Mansell, Kevin Hill, Steve Woods and Matt Hockley. Paul Buckle had no previous managerial experience (he had been a coach at Exeter City), but at the end of his first season in charge he had guided the Gulls into the promotion play-off places, and a Wembley appearance in the final of the FA Trophy. In his second seasonm he successful lead the Gulls back into the Football League via the play-offs and a 2-0 victory over Cambridge United at Wembley. Despite being one of the most successful managers at Plainmoor, Paul Buckle was a bit like Marmite and Gulls fans either loved him or hated him. He was not afraid to make difficult decisions and was prepared to release fan-favourite players - releasing the spine of the Conference winning team (Chris Todd, Chris Hargreaves and Tim Sills) during the first season back in League 2. There were however many memorable moments during his time in charge - 2 Wembley appearances; 1 appearance at Old Trafford; fantastic cup runs (including victories over Yeovil Town and Blackpool) and of course successfully leading the Gulls back into the Football League. It is for this achievement, if nothing else, that we say "Thank you Paul Buckle". 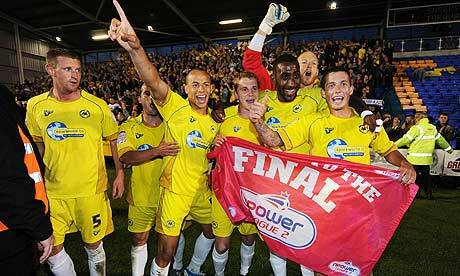 In only their second season back in the Football League, Torquay United have made it through to the Play-off Final - against Stevenage on Saturday 28 May 2011 at Old Trafford, Manchester. Finishing seventh at the end of the regular league season, Torquay United faced a two-legged semi-final against Shrewsbury Town - the team that had finished fourth in the league, 11 points ahead of the Gulls. In the home leg, Torquay United dominated the match, with goals from Chris Zebroski and Eunan O'Kane giving them a 2-0 lead. In the away leg, the Gulls were held to a goalless draw which meant they won 2-0 on aggregate. Congratulations to Paul Buckle, the players and staff at Plainmoor on this excellent achievement.